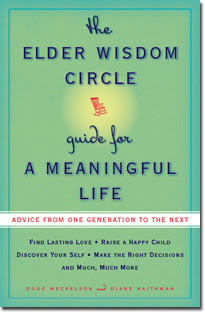 I read in Real Simple about a site called Elder Wisdom Circle--a place where you can pick up a "cyber grandparent" and ask him/her questions about life, parenting, marriage, finances, you name it. I decided this might be an interesting experience so I jumped on the site and asked a few questions. Within two days I had an answer from "Aunt Patty". I found it to be a worthwhile experience even though I didn't necessarily learn anything new because it reminded me what I've already learned, read, etc. and gave me additional motivation to press on. I highly recommend trying it out! 1. What do you wish you had done differently with your kids? 2. How do I teach them responsibility and accountability? 3. How do I parent with discipline and firmness without going too extreme that I turn them away and cause them to rebel? What I really wish I had done with my kids is to have made sure that one night a week was family night and no matter what, we would all be home for dinner and stay home playing games and talking. It would have given them a sense of connectedness, to be with their family and talk with us and tell us what was going on in their lives. I also wish I hadn't let some of them quit school before graduation. Yet sometimes kids get so tired of school and they think they would enjoy working more. And when they get a job, it's a real drag and they wish they hadn't quit school! Some people teach their children responsibility by getting them a pet and the child is responsible for taking care of it. Sometimes it works and sometimes mother winds up taking care of it. I'd start small by making them responsible for cleaning their rooms every day, or picking up their toys and putting them away. Give them chores--small ones--around the house. If they are older, make the choores a little bigger. Boys get a lot from joining the Cub Scouts and later the Boy Scouts. Girls can become Brownies and Girl Scouts. All of these groups foster a sense of growing and doing more, both for yourself and for other people. Parent first with love. Sometimes discipline is needed if your child is going wild and becoming unwieldy. Start taking them to church early, if you go. No use sending them by themselves. That's not the way to do it. They will rebel anyway when they become teenages, so don't worry about that. I wish you the best of luck. Get a good book about child rearing. You may get a few more ideas. Umm, hello? FHE? A great idea that the world is just now catching on to. It's nice to know that we're already doing at least one thing right!